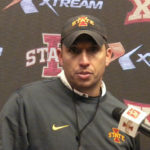 Iowa State coach Matt Campbell expects to see continued growth with the Cyclone program. ISU posted its second straight eight win season after a 28-26 loss to 13th ranked Washington State in the Alamo Bowl and a large number of starters return. Campbell says he will remember this year’s team as “gutsy” after bouncing back from a 1-3 start.